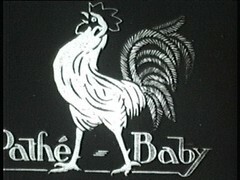 Those who regularly read this blog maybe remember that I found last year two old 9,5mm Pathé movie rolls with some rugby footages. So, here we go ! I had them digitized (by a specialized lab) and edited (err... by myself) and ready to be shared... a worldwide exclusivity as I've never seen such videos on the net before ! 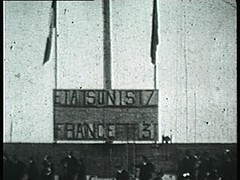 The best part of it is a 2' video coverage of the rugby final between France and USA at the 1924 Olympics in Paris. 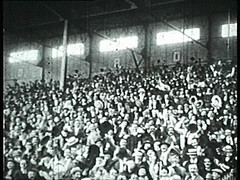 That day (May 18th 1924), a strong, fast and energetic American side won an undisputed gold medal versus a disapointing French team. Final score 17 - 3 to the US team. I'll do the editing again soon ! I had to make jpg snapshots of every text frames and insert them manually into the editing... Not a big deal, but when you read them 100 times, you just forget what should be the appropriate reading time for them ! "Puis, cinq minutes avant la fin, d'une melée, Patrick traverse toute notre défense, comme s'il avait les Roumains devant lui, et c'est un ultime essai pour l'Amerique. Pas de but." Also, the first try is credited to Farrish. Don't know what are your sources and I don't have any other newspaper report to compare with Le Figaro's one... So it can be a journalist mistake as well. I agree that news reports can be very messy at the time !! I've just checked three different reports (*)... to find three different lists of try scorers... total mess ! Great video! My great uncle Philip Clark was on the USA team, so I have heard all my life about the 1924 gold medal win at the Paris Olympics. I will share this site with my family! It is hard to believe that the USA is the defending gold medalist in rugby at the Olypmics. Great video, what a treasure trove! My wife and I were caregivers to Norman Cleaveland, a member of the 1924 rugby team, during his last years. He died in 1997 just short of his 96 birthday in Santa Fe, New Mexico USA. He told me many stories about the 1924 Olympics and that the team had to run thru the tunnels to escape the mob of enraged French. He also said there were riots in the stands and injured Americans were carried passed the on field fence for protection. The team did not receive their medals for 3 months because of the hostilities. As stated before they were not looked kindly upon in the streets of Paris, but a newspaper article was printed, in words, shaming the French treatment of the Americans whereupon they were able to move about more freely. I have seen and touched the gold medal which has a rugby football in relief upon it. The medal is now in England. There are some pictures of members of the team here in the USA and the Diploma depicting the event. At the time of the 1996 Olympics Norman was interviewed many times and brought out the medal at just a whisper of encouragement. It was thought he was the oldest living Olympic gold medal winner at the time. Many rugby teams came by his home to listen to his tales of the games plus his family's history in New Mexico. Norman went on to write several books and papers on his family's history as well as the many years he spent in Malay as president of a tin mining company protecting his employees against the communists in the years leading up the the Vietnam war. He was my friend and a most remarkable person. I am so glad to have stumbled across this remembrance of my friends triumphs one in his very rich life. He would be glowing and probably is. I enjoyed reading your post very much. I am a writer that has been working on a script depicting the events surrounding the 1924 team. Over the last couple of years of research I have become a bit of an expert on the events and persons surrounding that moment in history. Some information remains questionable - such as - was Dan Carroll with the 1924 team? I cannot find any hard evidence that he was. In fact, I suspect he may have been injured in a 1921 game against British Colombia that ended his rugby career. Futher, there is mention of him being in England with Standard Oil after 1921. Is it possible that he was the "hook-up" between the No. Cal team and that east coast guy Alan Valentine? And I have noticed quite a few ruggers from the '20 - '24 teams going on to oil company jobs. I know that O'Neil's father was in oil, and wealthy - did he get his rugby pals jobs after the Olympics? I'm really interested in the personalities...For example, was Patrick really as big a blow-hard as my limited information suggests? Was Rudy Scholz just nuts? Why did Tilden, Jr. go with the team to France but not play? Did he get injured too? How about Sam Goodman? Was he the wheeler-dealer he appears to have been? DeGroot,...a big, lovable monstor? Anything you can remember would be greatly appreciated and hopefully make it to the big screen someday. My address is [email protected] Thank you. I'm afraid that I can't help you much to answer all these very detailed questions... I hope that some visitors could do it! 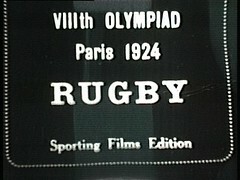 The more I learn of the 1924 Olympic rugby games, the more facinating the story and characters become. I've recently finished reading Mark Ryan's excellent book. He said that French forward Lubin-Lebrere had but one eye. Increadable! He would then have come at you in a tackle with one side of his head turned forward! I have viewed your wonderful flim footage you have posted above. I do not see fences at twice their (normal) height as is reported by many sources. I see two fences. One fence placed a few yards infield from the other. A sort of "catching ground" for the gendarmes to collar the fans coming out of the stands before they could reach the field. I believe that the press reports that were filed that day were most likely done in French...and that what was "two fences" in French became "fences twice their height" in translation to English. So goes history. Oh yeah! Awesome..I remembering my old days. Simple post. Attracting well. Thanks once again. I have been raised also hearing tales of the 1924 team. My great uncle Hugh Pete Cunningham was on the team as well . do you have or need any information on him? Is it possible to get access to the full (unedited) video footage? I'm a journalism student working on a story about the 1924 team, and anything that could tell me more about the final would be really useful. I'm a journalism student working on a story about the 1924 team, and am really interested in finding out anything you might know about your great uncle. Would it be possible to chat to you? I'm a journalism student working on a story about the 1924 team, and am really interested in finding out anything you might know about Norman Cleaveland. I have a little info on him that I've scraped from archives in California, but not that much.